Jayne Kelly was born in the Bronx, NY and grew up in West Babylon, Long Island. She began studying piano at the age of eight with Sonia Stein, a Russian pianist. After the death of Ms. Stein, she studied with Walt Multer through high school.Ms. Kelly went on to the Crane School of Music, studying with Frank Iogha. Following graduation in 1981 with a degree in Music Education, she eventually settled in New Hampshire where she met her mentor, a Lithuanian pianist named Yura Chute. Her musical influence remains very much alive in the music Ms. Kelly chooses to perform. 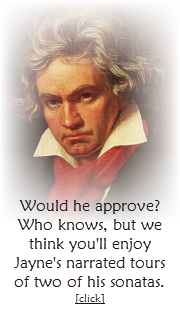 Jayne’s recording, Virtually Live, features a wide range of compositions from classical and contemporary composers. 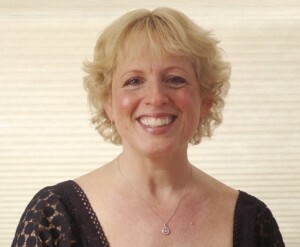 She has also recorded “Recurrences,” a composition by New Hampshire composer Marilyn Ziffrin. 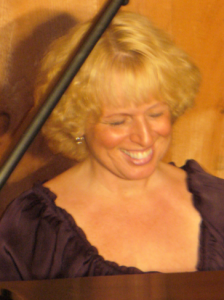 In addition, Ms. Ziffrin has written a piano sonata for Jayne which she premiered in Concord, NH in September 2006. Jayne’s technical skill and expressiveness, along with her ability to find the inner voices in a wide variety of classical pieces, have won her many followers. Her performance venues include Steinert Hall in Boston and the Concord City Auditorium in N.H. Jayne has recently been profiled in feature articles in the Concord Monitor and the Keene Sentinel and has been interviewed on several radio stations including New Hampshire Public Radio’s “Front Porch.” In the spring of 2007 she was featured on New Hampshire Chronicle (WMUR Channel 9). In addition to her love for classical piano, Jayne has recently discovered a passion for singing Jazz as well as other styles of vocal music. Accompanying Jayne are pianists Walt Sayre, Robert Johnson. While pursuing an ever-expanding performance career, Jayne continues to maintain a full teaching schedule. Although she enjoys students of all ages, she specializes in working with adults. Lessons are offered in her Keene, Washington , and Concord studios.